It may be a little late to get the Addiction-NV Candy Cane Lip Balm in time for the holidays, unless you happen to live near a location that carries it (available here). But if you like unique packaging designs and a peppermint lip balm, it's not too late to order one for yourself. "The swirled holiday red and white lip color hues blend to a flush of pink that's perfect for every skin tone and complexion," explains Noel Sweeny, West Coast Makeup Artist and founder of Addiction NV Cosmetics. It looks like a candy cane, tastes like a candy cane, and is made with real candy cane flavoring and spearmint essential oils. Naughty but Nice is mouth watering, moisturizing treat that winterizes and protects lips as it softens and hydrates them! Our lip balm is jammed packed with vitamin E, aloe vera, shea butter, spearmint, apricot and sweet almond oils to hydrate as it calms and soothes. 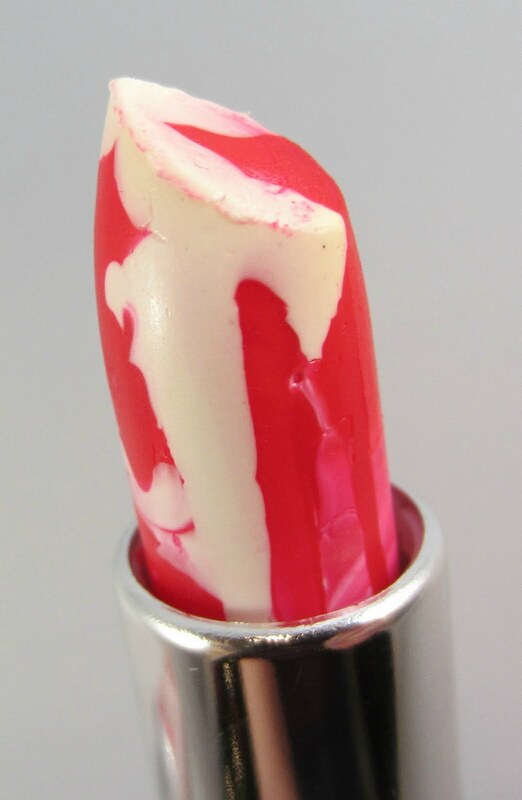 The unique red and white swirl lip balm gives you a flush of pink shade perfect for every skin tone and complexion. 'Tis the Season to be Naughty!!! This is such a fun little product with it's quick-click design. You simply push the end of the tube, and the inner tube pops out. The design is genius, and I love the graphics on the outer tube. This lip balm is a tasty treat for your lips, and it's very moisturizing and soothing. It adds a nice flush of glossy pink color, and even after the shine has worn off, my lips still have a hint of color. This tastes minty and smells of peppermint, and I have become quite addicted to it! That lipbalm looks really cute and delicous ! That's a really neat product! I'd love to get one of those. I love candy canes & lipsticks so that's for me. Yummy!